As you know, a lot of my time lately has been occupied by painting and redecorating. Our bedroom "redo" is coming along nicely, although we've currently reached a plateau. It's always at this point of a redesign that I kick myself for not taking "before" pictures. What was I thinking? How can I sell you on my incredible decorating skills if you can't gain some perspective by seeing where we started? Thankfully, in this case, I do have the photos we took when we were first courting this house; during the initial love affair and before we could imagine flooded basements and seven major appliance replacements in a year and a half. Our master bedroom was pretty plain, and clearly built to accommodate a king-sized bed. Our queen looked like a refrigerator magnet on the large expanse of wall it touched. It had a very sterile quality, most likely attributed to the neutral walls, almost white carpet, and light colored flooring in the bathroom. We moved in our furniture, hung some drapes and called it good. We managed to fill the space sufficiently along the way by putting up an old bookshelf here, a picture on the wall there, and we took care of that white carpet with an exorbitant number of dog vomit stains. You know, for character. The bathroom was the real head-scratcher. I fell in love with the huge whirlpool bathtub and additional storage closet (behind the bathroom door), but we quickly started to discover that it really left something to be desired. Herein lies the rub: I HATE GOLD. Sorry, 1990, but gold is the new "orange and avocado". Our bathroom is adorned with brass around every corner, and I have found that looking at the brass is like starting at the sun-- it is so distasteful that staring at it will, in fact, burn your retinas. So, after viewing every bedding set on the internet, and an ensuing battle almost on par with the great "Name Our Baby" fiasco of 2009. Finally we closed our eyes, spun around and threw down a finger. We bit the bullet and ordered the bedding set. With that obstacle out of the way, we were able to purchase the other linens and wait for the bed to arrive. Our bedroom now feels much more sophisticated, and yet I feel like a little kid in a friend's living room with plastic on the sofas and carpet. I'm afraid to sleep in the bed, much less use the bathroom-- something I am being desensitized to every time Cael gets in bed with us in the morning without his underpants on. He's probably just pooped in the potty, too. I'm trying not to think about it. 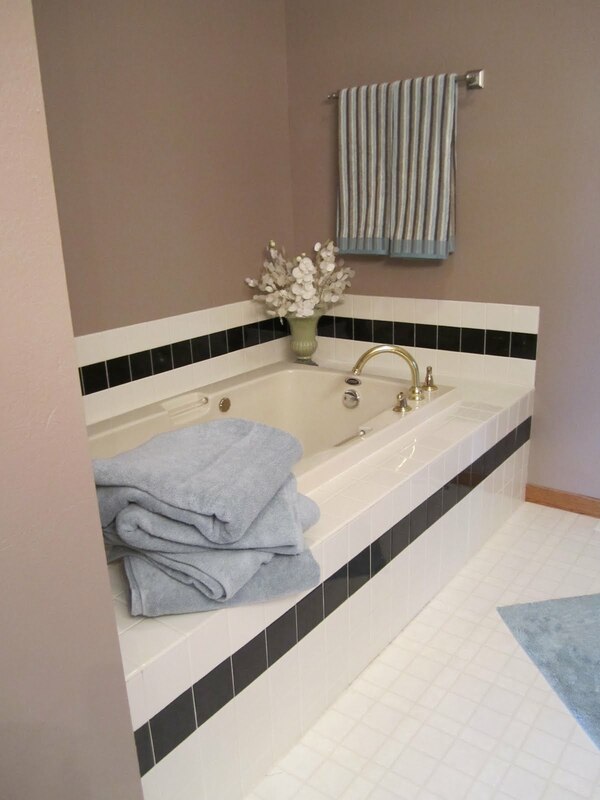 The bathroom got a bit of a makeover as well, thanks to a coat of paint, new towels/bath mats and by replacing a few of the seizure-inducing brass accents with more modern brushed-nickel fixtures. There are a number of things that still need to be addressed, however. Some art will need to be hung on the walls (especially above the bed) and the remainder of the brass items in the bathroom will need to be replaced. That, however, is a much larger project and will involve new flooring and an updated shower. Wait one minute-- did I not tell you about the shower? Our too-ugly-to-show-on-the-internet shower? That's because I am much too embarrassed to share it with you. I consider myself to be a pretty clean person, and I do my best to keep my house looking as nice as I can. But as all of you stay-at-home-moms know, there are skeletons in the closets of every home. Or the shower, rather. Seriously, there could be dead people in there for all I know. I won't use it unless I'm covered in radioactive material, which is ironic because I would not be at all surprised if the shower itself is covered in radioactive material. There are stains and streaks of mystery substances abound, and the shower itself is crumbling into a pile of metal shavings even my dog won't eat. Replacing the shower was actually the next item on our agenda of upgrades, but as our queen bed was moaning and groaning at us in protest, the furniture replacement put the shower on the back burner. I'm still hopeful that in the next couple of years we will be able to put a clean, new shower in its place and send the old one packing. I'm planning to ship it to Pfizer, where I am confident it will lead to new pharmaceutical breakthroughs. Until then, I will put on my hazmat suit and a smile. All caught up on your new blog! Yay, Mary! I love the bedroom...ahhh, a king-size bed. Love it! Maria- I love it! We've actually had some trouble with the mattress and they are going to replace it, but I love the size. Thanks! Love it! I want a king size bed! someday. Thanks, Heidi! I do love it. I wish I could say that there's SOOO much more room in the bed, but when Cael climbs in we're still a bit cramped. Could be because he has tentacles and CANNOT sit still. Just maybe.